Show rating: votes 13. Vote now! What would happen if a Shimigami(death god) get's bored and drops his notebook into the human world, a notebook were everyone whose name you write in it will DIE within 40 seconds ? and what if it falls in the hands of a extremly smart young student who doesn't mind killing of some criminals;). yeah thanks a lott its a realy good show. Posted: Sun Mar 25, 12007 6:43 pm Post subject: The End? It was good, but i think it ended too early. Are you sure there was all of episode? Becouse i think there was 1 episode missing it ends so weirdly. Posted: Sun Mar 25, 12007 7:47 pm Post subject: Re: The End? Posted: Wed Mar 28, 12007 12:10 pm Post subject: Re: The End? Is there an English dub version? Well i dont know if there is but atleast i haven't found. 1. There are roughly 6,500 spoken languages in the world today, so how can you speak all of them? 2. what's with all the apples in the show? i'm sure even the asgard don't speak every language. and i'm pretty sure thor never probed anyone. WOw thanks you so much. There has to be more b/c at the end it says "To Be continued"!!!! i must find this episoded !!!! 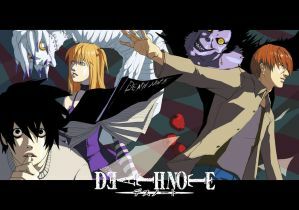 i must have the 2nd seasson of DEATH NOTE!!!!!!!!!!!!!!!!!!!!!!!!!!!!!!!!!!!!!!!!!!!!!! !